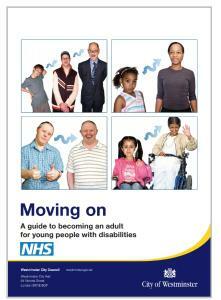 'Moving On' is the council's Easy Read Guide on preparing for adulthood. What is Preparing for Adulthood? Children legally become adults at 18, regardless of their needs. It's a time of change and we aim to help everyone plan for, support and recognise a young person's adult status. For children and young people with a disability, when we talk about Preparing for Adulthood, it means the ‘Transition’ from being a teenager to being an adult, at which point the young person may also move on from using children’s services to adult services. This is a time when young people gain new rights and responsibilities. Preparing for Adulthood can be an exciting time for young people, full of new opportunities, but it can also be a time of uncertainty so planning is important. 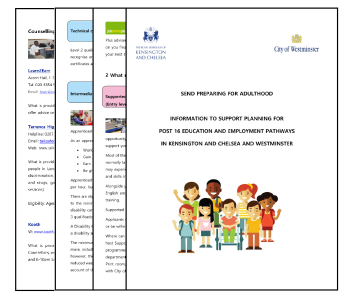 Please follow this link for our Bi-borough Preparing for Adulthood Protocol, which has been developed in partnership between practitioners from Education, Health and Social Care. The Protocol provides guidance to the workforce across education and social care as they support young people and their families to plan for the transition from childhood to adult life and acts as a guide for young people and parents about what they can expect. How Do I Prepare for Adulthood? We start working with young people when they are in Year 9 to plan their move towards adulthood. Families or carers are fully involved in this planning. Here are a few things to consider when preparing for adulthood. Education - Do you want to continue studying? Find out about courses available through school, college or work placements. Work - What job do you see yourself doing in the future? What support will be needed to work towards this? Think about supported internships, apprenticeships and traineeships. Money - Look into benefits, budgeting, paying bills and saving. Find out about paying for adult social care and funding to meet people’s needs. Getting around - Participate in travel training, find out about free bus travel with a disabled person's bus pass and think about how they'll pay for transport. Housing - Where are you going to live? Do you want to stay at home with your family, share a home with your friends, live with a carer, or have a place of your own? What support or adaptations will be needed? Health - How will you get the right healthcare? Find information about staying healthy, making healthy choices and physical, mental and emotional wellbeing. Activities - What do you want to do in your spare time? Find out about local acitivties supporting young people with disabilities. Relationships - Making friends, having a social life, dating and relationships may be important to you. Make sure you know how to keep safe and maintain your sexual health. The following video from the Council for Disabled Children gives an introduction of options to consider as you or your child approach adulthood. Deciding what to do after leaving school can be a challenging and confusing time. Most of us want to develop our skills and experiences to prepare us to get a job. But what is the best way? This Pathway Planner has been put together to help you in your journey into work; whether you have never worked before, are returning to work or if you want to develop your skills in preparation for work. 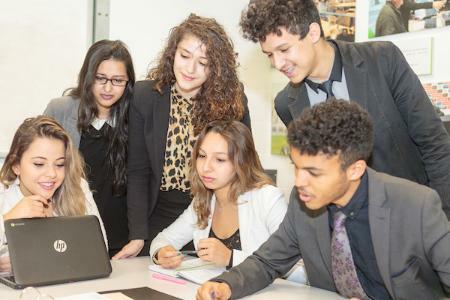 Some of the services listed in this directory will help you consider your education, training or work programme options so you can decide which feels right for you, in your journey after leaving school. Download the Pathway Planner by clicking here. How Will Support for Parents/Families Change? When a child reaches adulthood, the way their parents or families are supported will change. To understand your level of needs and what support should be provided, the council will invite you to complete a Carer's Assessment. This is a way that you can let the adult social care team know about your caring responsibilities and how they affect you. After completion of the Carer's Assessment, the council will let you know what support they are able to offer. It might include training, help with transport, or short breaks away from caring. This will be detailed in a personalised Support Plan. 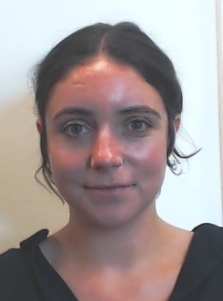 Our SEND Employment Pathways Coordinator, Rachel Edwards, is working to develop the range of local employment opportunities that are accessible to young people with special educational needs and disabilities (SEND), with the aim of increasing the number of those who enter paid employment. Working with Economy teams, education providers and employers, Rachel will be creating a range of work and training opportunities including; work experience, Traineeships, Supported Internships, Apprenticeships and jobs for young people who aspire to work. Please see West London Alliance's 2019 Guide to Supported Internships by clicking this link. If the young person is eligible for support following assessment, your local transition team will help with the preparation for adulthood by exploring the young person’s needs, wishes and circumstances and will help with planning for how needs can be met. The young person, their family and their carers are encouraged to take an active role throughout this process to ensure they are properly listened to, and are at the centre of planning and decision making. For more information, contact Westminster's Learning Disability Partnership (WLDP) on 0207 641 7411 or via adminwldp@westminster.gov.uk. WLDP has designed a pathway to support young people in their transition to Learning Disabilities adult services. This pathway explains professional involvement, time scales, when assessments will take place and what young people and families can expect in terms of eligibility for learning disabilities services and Adult Social Care. This pathway puts the young person at the centre of the process to ensure the transition to WLDP is well planned and that needs are met through appropriate assessment and care planning.